When it comes to baseball, I’m old school. I prefer the Senior Circuit (NL) to the Junior (AL) primarily because of the designated hitter. I guess my biggest qualm with the DH is the pitcher doesn’t have to face the music he writes; he can pitch inside all day and maybe plunk a guy or two, but he knows he’ll never see a retaliatory high-and-tight, 95 MPH fastball anywhere near his chin – that present is saved for his position players. But the DH conversation is one for another day. 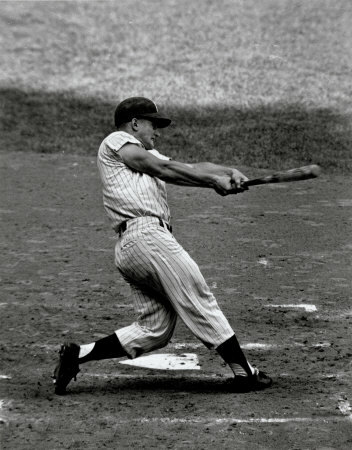 I still consider Roger Maris to be the single season home run champ – 61 in ’61. Hell, my email address is MarisIn61@gmail.com! So when the conversation of how performance enhancing drugs (steroids, HGH and what not) have tainted a lot of the all-time records I can get pretty heated about it. I hate seeing Roger Maris at No. 7 on the single season home run list. Sammy Sosa had three seasons where he surpassed 61 (63 in ’99, 64 in ’01 and 66 in ’98), Mark McGwire had two (70 in ’98 and 65 in ’99) and Barry Bonds has one (73 in ’01). I could go in to an entire spiel about those three guys and how their numbers are tarnished, but I won’t…at least not in this post. No, this post is to introduce you to (or remind you of) a few players who I personally believe juiced through the 90s and early 2000s. Most baseball fans over the age of 30 should at least be familiar with all the forthcoming names. I’m not going to bother with people such as McGwire, Sosa, Rafael Palmeiro, Ryan Braun, Manny Ramierz…they’ve done enough to prove their respective guilt. I will focus on guys who were well known, but whose names aren’t brought up in the PEDs conversation as much as the aforementioned. Please feel free to argue my choices or add some names that I left off this list. -First Tier PEDs Player: Barry Bonds, for examples, is a first tier PEDs guy. He was great – a probable Hall of Famer – before he touched PEDs, but put up numbers that should make him known as the greatest baseball player of all time after he started juicing. -Second Tier PEDs Player: A second tier is a player who was good, but became very good or even great because of PEDs. -Third Tier PEDs Player: A third tier PEDs player would be someone such as Jeremy Giambi (who I’ll talk about later) or Frank Menechino – these are players who’d probably never taken a swing at a Major League pitch had it not been for PEDs. Without further adieu, here is Smitty’s Top 10 List of Position Players Not Named Bonds (or McGwire, or Sosa, or Braun, or…) Who I Think Were Juiced Out of Their Minds. The following are four guys who I feel like I can say for sure were juicing during their best years in baseball. Let me first say this about Bret Boone – he’s a very nice guy. I met him back when I was an intern for MLB.com covering the Mariners in 2005. I was in the locker room when the Ms released him – it was one of the most gut wrenching things to witness. The late, great Dave Niehaus and Rick Rizzs came down after the game to say their goodbyes and the three of them sat at Boone’s locker and cried together – well, Niehaus and Rizzs cried, Boone was bawling. I genuinely felt bad for the guy. I’m sure he knew his days in baseball were numbered – that has to be a difficult realization to come to. So, like I said, I liked the guy as a person. He did a lot of charity work in and around the Seattle area. But of all the second tier PEDs guys, he was one of the worst offenders – at the very least he was a prime example of a Tier 2 guy. I’ve been a Cubs fan since I was six years old and a Braves fan since the early 90s (read about all that here). So by the time Boone returned to the Mariners for his second stint with the team in 2001, I was quite familiar with the skinny, gold-glove-caliber second baseman because he spent several years playing against my Cubbies in the NL Central for the Reds and one year with my Brave-Os. 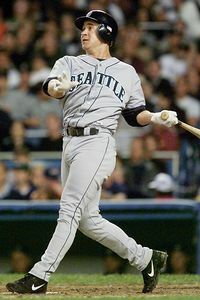 But the first thing I noticed about 2001 Bret Boone was how big he had gotten! Prior to 2001, Boone was a .255-ish hitter with a little pop in his bat. He hit 24 homers in ’98 and 20 in ’99. Before that, he had never hit more than 15 and only hit 7 in ’97 in 501 at-bats. But his numbers jumped significantly in his first year back with the Ms.
Hit hit 37 home runs, had 141 RBI (for comparison: Ken Griffey Jr only drove in that many runs twice), carried a .331 batting average and slugged .578. His numbers dropped drastically in ’02 (24 HR, 107 RBI, .278 BA, .462 SLG), popped back up in ’03 (35 HR, 117 RBI, .294 BA, .535 SLG…another round of juice, perhaps?) and then took another dive in ’04. I’d be less suspicious of these ups and downs in numbers had they occurred in his mid-20s, but Boone put these numbers up in his early to mid-30s – a time when most players have already seen their best years and are on a downward slide. Statistically, 28 years of age is the best year a hitter has in his career. One of the most consistent similarities most PEDs users have is they put up career numbers at an age most people are just trying to hang on – such is the case with Boone. 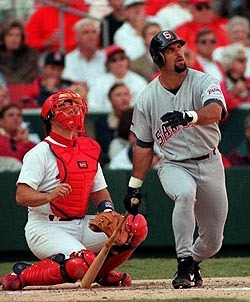 Just looking at Ken Caminiti was scary. It wasn’t always that way, but by the time the mid-90s rolled around, he had definitely become someone you didn’t want to run across in a dark alley – at least that’s the way he looked. He struggled with drugs and alcohol addictions during nearly all of his Big League career. At some point, he admittedly, added steroids into the mix – my guess is it was about 1994. Caminiti always had power. He was mostly a doubles hitter for the vast majority of his career. But in 1995, those doubles in the gap started turning into power alley home runs. He smashed a career high 26 home runs and drove in a career best 94 runs in ’95. He also hit over .300 for the first time in his career. Not surprisingly, it was his first year with the Padres. So maybe he was feeling some pressure to produce (a common story told by many who have admitted to using PEDs) and earn his new contract. Everything came together for “Canon-itit” in ’96 when he slugged 40 home runs, 37 two-baggers, drove in 130 runs, batted .326 and slugged .621…and won the NL MVP. 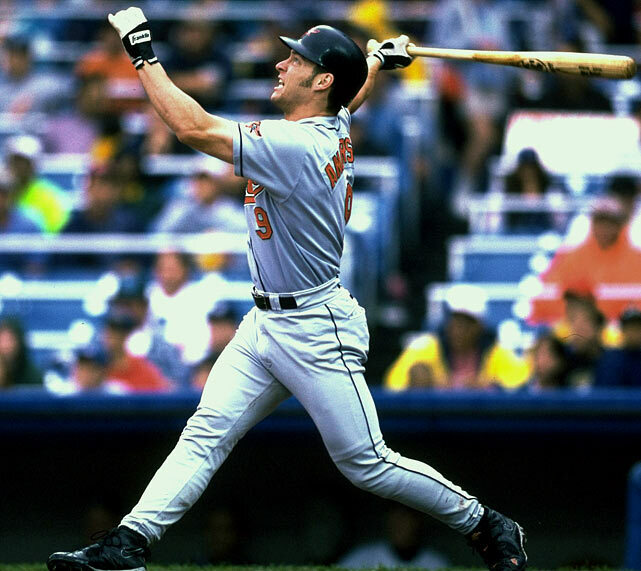 He had a noticeable drop off the next two years, hitting 26 and 29 home runs, respectively, and saw his average drop by more than 70 points in ’98. Once again, I understand sometimes players simply have a stretch of their career where they see the ball well, have good at-bats, are surrounded by other solid players and put up great numbers for those reasons. However, when your power numbers triple after the age of 30 I become very suspicious. As I said earlier, Caminiti admitted to steroid use so seeing what the ‘roids did for him gives us a baseline of sorts to compare other supposed steroid users’ numbers to. Brady Anderson’s career numbers are very similar to those of Caminiti; both broke into the majors at 24 years of age, both could hit for a decent average and both had a little pop in their bats (though they were mainly doubles hitters, not home run hitters). The 1992 season was the year Anderson got a chance to showcase what type of player he was. Prior to ’92, Anderson was a platoon outfielder with a little pop and plenty of speed. But he ’92 was that magic year where most ball players reach their full potential, and for all intents and purposes, Anderson showed he would make a wonderful center fielder for the Orioles posting the following numbers as a 28 year old: In 159 games he led the AL in plate appearances (749), hit 21 homers, drove in 80 runs, batted .271, had 28 doubles, scored 100 runs and stole 53 bases. He also had a good feel for the strike zone ending the season with a 1:1 K/BB ratio (98/98). Most teams would be elated to get that type of production year-in and year-out. But that wasn’t good enough for Brady. Fast forward to 1996. Brady is now 32 and is coming off three seasons (including the strike-shortened season of ’94) of hitting in the low .260s, home run numbers in the teens (but eclipsing 25 doubles in each of those seasons) and stolen base numbers in the mid-20s to low 30s. By the end of the season, Anderson has done something nobody ever thought he was capable of doing. He did something only 11 players in the history of the game had ever accomplished – 50 home runs in a single season. Ruth, Mantle, Maris, May, Foxx, Greenberg…and Anderson? No way! Something was up, and that something was steroids…in my opinion. I’ve read a few articles that say he admitted to taking a bunch of creatine, but I, along with a lot of other people, don’t buy it. In no way am I trying to say Anderson wasn’t a very good baseball player – he absolutely was. Even as late as 35 years old he hit 24 homers, stole 36 bases and hit .282. He always had a great eye throughout his career and I don’t see steroids helping that out – that’s simply having a great eye and discipline. But again, I feel he is an example of a Tier 2 guy – a very good baseball player who was made great by PEDs. I have always suspected Tejada of being a PEDs guy. For whatever reason, right off the bat (no pun intended…ok, maybe), I thought something was fishy with him and honestly, I don’t know why. If you go through and look at his numbers, there isn’t really anything that looks out of place. His numbers suggest it took him a minute to adjust to Big League pitching, but once he did he was consistently solid for a long stretch of time. He started putting up power numbers right about the age where you’d expect – 26 or so – and continued through about the time you’d expect a decline – heading into his mid-30s. He, like the other guys I’ve talked about here, was primarily a doubles guy turned home run threat. He led the AL in doubles twice (50 in ’05 and 46 in ’09). 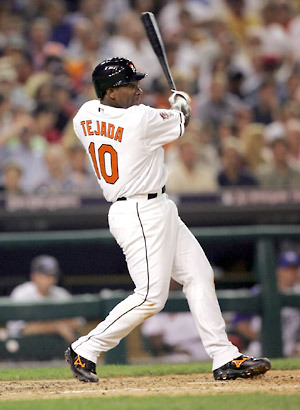 He led the AL in RBI in ’04 with 150 (he also had 40 doubles, 34 homers and batted .311 that year). He also played in every single regular season game between 2001-06. Oh yeah, he also won the AL MVP in 2002. None of these things, in and of themselves, indicate to me that he was necessarily on steroids or other PEDs – I just always felt like he wasn’t doing it naturally. I know he claims it was all because of Adderall and some lapse in an exception MLB had given him, but I don’t think they’d suspend him over a simple lapse. Even if they would, if it was as important to him as he says it is, he would have stayed on top of it. Plus, he even admits to buying HGH in the past. He says he threw it out and never used…didn’t Bill Clinton say something similar about pot? I don’t buy it, therefore, Tejada lands on my list. The following players have either admitted to using or have numbers that make me suspicious. – Shawn showed he had some pop when he first came into the league as a young guy. He was 20 in his first at-bat in 1993. His first real sign of power came in 1995 when he hit 15 bombs in 121 games. He turned 25 a few years later and went on to hit 35 homers in nearly 700 at-bats (he hit 16 the year before). Much like all the other guys I talked about, he was a doubles guy who started putting them over the wall all of a sudden and just as suddenly dropped back to hitting fewer than 20 homers: He hit at least 35 bombs four times between ’98 and 2002 – then hit only 19 in 2003…seems odd to me. – “Gonzo” was another guy who, when he hit 57 bombs in 2001 – the height of the steroids era – I was like WTF?! He broke into the league in his mid-20s as a guy with some pop, but was mainly a doubles hitter (seeing an pattern here?). He banged around the game for a while with a nice average, excellent eye and some gap power. He first surpassed 20 homers when he was 30. He had his monster year at the age of 33 – once again, when most guys are either beginning their downslide or are already well into it. He never hit 30 homers again. Once again, that throws red flags up to me. -Having been a Braves fan for most my life, I’m a bit hesitant about putting Javy on this list, but when looking at his power numbers from 2002-04, I get a bit skeptical. He hit 11 homers in 109 games in 2002, but followed that up with a record 43 (most homers in a season by a catcher) in ’03. He then hit 23 and 15 in the next two seasons. He hit 43 homers in only 129 games and only 23 in 150 games. He did hit 34 bombs as a 27 year old in 133 games, which is why I hesitated putting him on this list. Alas, his 43 homers were in a contract year so he finds himself on my list of suspected PEDs users. -Hidalgo falls into the category of “he did it at the right age, but it still seems odd to me.” I get particularly skeptical when a guy all of a sudden hits a bunch of homers a season after not hitting many and then falls off drastically following his big season – this is the case with Hidalgo. He hit 15 homers in 449 at-bats as a 24 year old then blasted 44 in 644 at-bats the next season,which happens. Sometimes guys just find their power stroke and then that’s who they are. But at 26 Hidalgo could only muster 19 dingers in 593 ABs and he never hit more than 28 again. I just don’t buy it so he, too, finds himself on my list. –This one is pretty simple: he and his brother, Jason, admitted to using PEDs in their careers. Jeremy is what I’d call a Tier 3 guy. His numbers were never terribly impressive, but good enough to bang around the Big Leagues for a few years. He hit 20 homers in his best season, but without help from PEDs the only way he’d ever seen the inside of a Major League stadium was in the family section watching Jason play. As a side note, I’d consider Jason a Tier 2 guy. –There’s nothing really in this guy’s stats that indicate anything resembling steroids, but that’s because I consider him to be a Tier 3 guy – someone who’d never played at the Major League level if it weren’t for some sort of “extra” help. I remember watching Frank play against the AAA Portland Beavers and thinking “damn, that guy must be roided out!” I mean, I could be wrong, but this guy was freakishly ripped out and stood a measly 5-foot-9. Oh, and for what it’s worth, he’s buddies with Jason Giambi.